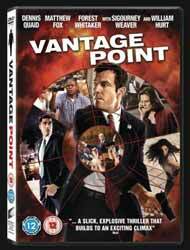 Vantage Point is a movie that has all the ingredients to be a great political thriller... but ends up being a little too two-dimensional. It also tries a little too hard to copy the same cinematic style that was made famous by 24 - hand held camera, quick cutting and extreme close ups in an attempt to make you believe that you're being throw straight into the action. The idea is interesting. Take an event and then tell it from the eye-witness point of view of several different characters - all of whom see a different aspect than the others. As each different point of view unfolds we realise that not all is what it seems. The movie opens with the point of view of Rex Brooks (Sigourney Weaver), TV producer of one of the many news teams that is covering the summit. She and her team are located in a mobile studio just outside of the location of the summit, editing the live news footage that her reporters and camera crew are providing. We see the events unfold and then time rewinds and we see the point of view of Thomas Barnes (Dennis Quaid) a member of the secret service who is assigned to protect the president. Once his story has been told, we rewind several more times in order to follow the point of view of Enrique (Eduardo Noriega) an undercover cop who gets caught up in everything accidentally, Howard Lewis (Forest Whitaker) an American tourist who is in Europe for the first time; President Henry Ashton (William Hurt); and finally we get to see the terrorist group's point of view - which then bleeds into the rounding up of the final elements with all the eye-witnesses appearing and playing their part. Out of all of the characters, Whitaker's Lewis is by far the most likeable and three dimensional. I suppose it's no surprise, as Whitaker has that everyman quality that makes an audience instantly relate to him. Sadly, what could have been a decent movie fails because of the fact that it doesn't carry out it's basic idea through to the bitter end. As the director states on the extras, this movie is supposed to show an event from many different perspectives so that there is no right or wrong, just shades of grey. So, where is the sympathetic slant to the terrorists? They just appear to be cold blooded killers. If Pete Travis had been an American director I'd have thought that this movie was simply anti-terrorist propaganda. It's a shame, because if the terrorists had been given a little more depth to their characters this would have been a much better film. Instead, we have the president failing to retaliate against the terrorists because he wants to prove to the world he is stronger than that... yeah, whatever - cue loud American whooping and high fives aplenty. The other problem is that you never find out what the terrorists plans really were. Why did they place a bomb under the stage after the president had been shot? Was this to allow the terrorists to escape from the scene after the president was shot? Wouldn't a much less riskier solution have been to have the head of the terrorist organisation allow the woman to have aimed the gun while he and another terrorist (possibly the person who dismantled the gun - no plot spoilers here!) drove to the hotel to pick up the real target in the ambulance? Extras include an audio commentary with Pete Travis (to be honest this isn't really worth listening to as Travis spends most of the time telling you things you already know. The only interesting elements were the fact that the scene with the little girl running in front of a speeding car was done for real - i.e. no trick photography or CGI, that Hurt spoke with Bill Clinton about about what it was like to be the president, and that the the hotel they filmed in had only been open a week when they let the film crew turn the interior into a bomb site); An Inside Perspective (25 min, 29 sec behind the scenes featurette that interviews cast and crew); Plotting an Assassination (15 min, 21 sec featurette that is really just more behind the scenes material); Surveillance Tapes (43 sec spoof outtake with the director); and trailers for other movies. In the end, Vantage Point is just a very average, not to mention very short, movie.